If you are caring for a loved one, an aging parent, a spouse or child with special needs, a neighbor or a friend and if you are not a paid care provider, the Mullis Center is offering a free, six-week course, Powerful Tools For Caregivers providing helpful skills. The course will teach you self-care tools including how to reduce stress, how to communicate effectively with family members and medical professionals, how to deal with challenging situations, solve problems and set goals. Often family and friend caregivers had no plan to become caregivers but are responding to a need and may not even recognize at first that they have become a caregiver. The course offers tools, “designed to help a caregiver reduce personal stress, communicate feelings and needs, use community services, deal with emotions such as anger, guilt, and depression and make tough caregiving decisions”*. The course offers caregivers support in creating and implementing their own self-care action plan. 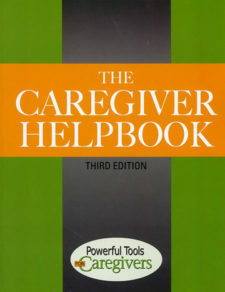 The book, The Caregiver Helpbook, will be available for class participants to borrow without charge. The class will be led by Aging & Family Case Coordinator, Gail Leschine-Seitz and Senior Services Specialist, Debbie Haagensen. The class will be held at the Mullis Center, 589 Nash Street, Thursdays 10:00 am to 12:30 pm beginning April 18th and concluding May 23rd. To register for the class or if you are interested in the class but may need help in order to attend please call Gail at 360-370-7528.